The Xbox 360 Wireless Controller can be powered either by AA batteries, or by the Xbox 360 Rechargeable Battery Pack. This article describes how to replace AA batteries. Note If you're using AA batteries, we recommend AA disposable batteries rather than AA rechargeable batteries for best performance. If you do use disposable batteries, see Disposable battery safety below. 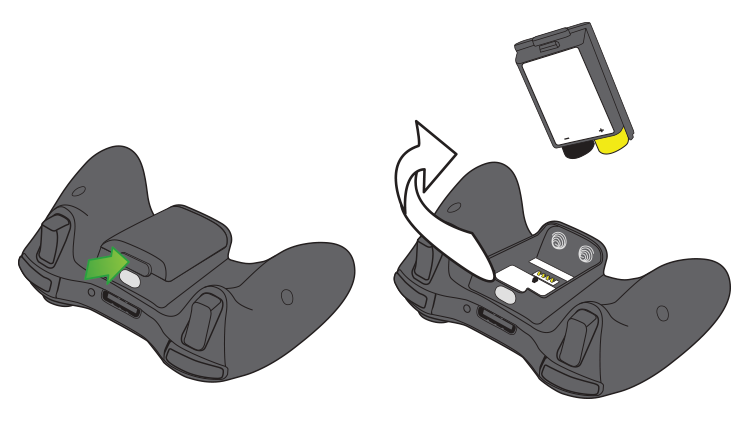 Press the tab on the top of the AA battery pack, and then pull down to detach the pack from the controller. Insert two new AA (LR6) batteries. Orientate them so that the positive (+) and negative (–) ends are positioned as shown in the diagram on the bottom of the battery pack. Slide the AA battery pack back into the controller, and then push in to close. Important Remove the batteries from the wireless controller before you board an aircraft, or before you pack the wireless controller in luggage that will be checked when you fly. The wireless controller can transmit radio frequency (RF) energy like a mobile phone whenever batteries are installed. Keep batteries out of the reach of children. Do not heat, open, puncture, mutilate, or dispose of batteries in fire. Do not leave batteries in the AA battery pack when the battery pack is not attached to the controller. Do not mix new and old batteries or different kinds of batteries. For example, do not mix carbon-zinc and alkaline batteries. Remove the batteries if they are worn out or when you store the controller or the remote for a long time. If a battery leaks, remove all batteries. Make sure that the leaked fluid does not touch your skin or your clothes. If fluid from the battery comes into contact with your skin or your clothes, flush your skin with water immediately. Before you insert new batteries, thoroughly clean the battery compartment with a damp paper towel or follow the battery manufacturer's recommendations for clean-up. Dispose of batteries in compliance with local and national disposal regulations. Relevant regulations include those that govern the recovery and recycling of waste electrical and electronic equipment (WEEE). Would you like to contact Support regarding the "How to replace the batteries in your Xbox 360 Wireless Controller" issue you were reading about or a different issue?